Featuring a terrace and free WiFi, Laidback Place provides accommodation in Bangkok. Fitted with a balcony, the accommodation offers air conditioning and features a flat-screen TV and a private bathroom with bidet. Emporium Shopping Mall is 5 km from the aparthotel. 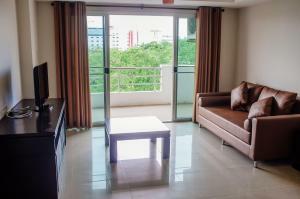 The nearest airport is Suvarnabhumi Airport, 26 km from Laidback Place. Rate: THB 1521.00 ... THB 3150.00; select dates below to get current rates.